As many advocates know, on Jan. 30, the Corporation for Enterprise Development released its 2014 Assets & Opportunity Scorecard, which reports on 133 policy and outcome measures that tell the story of Americans’ financial security today and their opportunities to create a more prosperous and secure tomorrow. 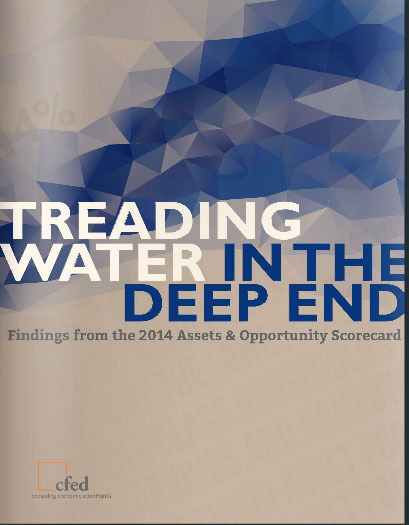 Titled “Treading Water in the Deep End,” the scorecard ranks states based on the number of policies passed that work to bolster the financial security of their residents. The scorecard examines all 50 states and the DC in five key areas: financial assets and income; businesses and jobs; housing and homeownership; and health care and education. The main finding is that nearly half of American families live in liquid asset poverty, meaning they do not have three months’ worth of liquid assets they can turn to in a financial emergency. This finding, though perhaps unsurprising, is especially problematic in light of recent signs of economic recovery. For the housing and homeownership issue area, CFED, working with a variety of partners, identified 11 outcome measures, 10 policy measures and two trend indicators to quantify the effectiveness of state efforts. The housing results vary across states and among policy types. States that have good homeownership programs may not necessarily have extended basic rights and protections to manufactured homeowners. And while nearly all states have some programs or policies in place to assist first-time homebuyers, many states do not necessarily offer security to renters. For example, federal law enacted in 2009 provides some protections to tenants in homes facing foreclosure, but fewer than half of the states have adopted protections that are stronger than the federal Protecting Tenants at Foreclosure Act. One of the positive findings of the this year’s scorecard is that foreclosures in 2013 were down from the previous year in all but two states, Arkansas and New Jersey, and that homeownership was more affordable in 44 states in 2013 than it was in 2012. Foreclosure rates, however, are still significantly higher than they were prior to the financial crisis. Sometimes foreclosures are not the only threats to a family’s biggest asset. While property taxes are important sources of local revenue, they can become a great burden on homeowners in markets where assessments are rising faster than incomes or where a household loses income. One way to protect these homeowners is to adopt a sort of property tax circuit breaker that gets triggered when the property tax exceeds a portion of a family’s income. Such a policy can help keep a family in a home and paying taxes, and avoid burdening the locality with a home seized through tax forfeiture. Though these policies make good sense, only ten states have adopted a policy that target all homeowners, rather than just the elderly or persons with disabilities, as well as renters, who pay a share of property taxes through rent payments. State policies governing manufactured housing—the most neglected homeownership market but an important part of CFED’s work to build the financial security of all Americans—need to be greatly enhanced to bring this sector into the mainstream. Two policies the Scorecard assessed, titling of homes and homeowners’ opportunity to buy their communities, are aimed to enhance the financial security and wealth potential of manufactured homes. Nineteen states have some sort of provision on the books to allow owners to title their homes as real estate. These vary widely in effectiveness, and a robust law is needed in each state, as I discussed in Rooflines last year, to ensure that all families can benefit from stronger consumer protections and a more competitive mortgage market. If homeowners had a fair shot to buy their manufactured home communities, their future would be safe from redevelopment, lot rent increases and arbitrary evictions. Yet only ten states have effective laws, such as reasonable pre-sale notice requirements to unit owners or tax incentives for community owners to sell to residents. Since so much discussion in the affordable housing conversation is on retaining what we have, states should look long and hard at this low-cost, market-based affordable housing preservation strategy. Preserving affordable rental housing, of course, is vital to ensuring stable and affordable communities. The National Housing Trust reports that for every one new affordable unit produced, two existing homes are lost to neglect or redevelopment. Therefore, it is imperative that public policy ensures that public investment in housing—through low-income housing tax credits, for example—provides returns for as long as possible. Yet, only 22 states require that such units remain affordable for at least 30 years. Other states should adopt such policies or, even better, adopt perpetual affordability, as Utah and New Hampshire have done. Tax-credit assisted properties do not typically meet the needs of very low-income Americans. The much older, much maligned and, yet very important deep subsidy programs such as Public Housing and Section 8 have faced significant budget cuts for years, limiting their reach. So it is important that states and communities do not restrict the rental choices available to voucher holders. Only eight states and DC have adopted anti-discrimination laws to prevent landlords from denying rental applicants solely due to their use of Section 8 vouchers. (Of course, landlords can deny applicants for many other reasons, such as poor rental or criminal histories.) The states that have enacted such laws may not be the ones you expect: North Dakota and Oklahoma have embraced these as common-sense policies. As you can see as you explore the scorecard report, states vary dramatically in both policy adoptions and policy outcomes. As in some other areas, the impacts of good policies can be blunted by other factors, such as high-cost markets, that complicate the effort to get good results. New York and New Jersey find themselves in this scenario, as they have generally good policies but rank low on the outcomes scale. In addition, in the housing arena, some states, such as Illinois, Oregon and Nevada, have adopted good policies on loan servicing and foreclosure assistance in response to the dramatic housing crisis that started six or so years ago. These policies will have relatively limited impact in response to this crisis, but very well may mitigate the impacts of the next one. CFED encourages state leaders and stakeholders to use the Assets & Opportunity Scorecard to examine what is happening in their communities and see what best practices are unfolding in other states. Housing advocates can also explore how certain good state policies can be implemented at the national level. There are lots of data available and lots of ways to use them. There are also many practical lessons housing leaders can learn from each other and advocate for together, ultimately improving the household security of millions of our neighbors.